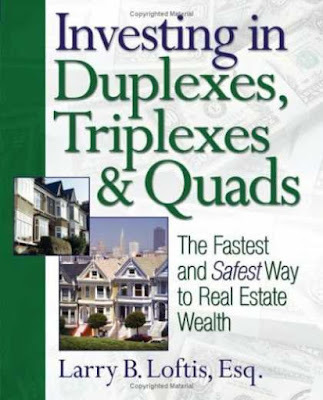 The book of the week was Investing in Duplexes, Triplexes, and Quads by Larry B. Loftis. I am so excited to talk about this book. It is really great. It may be my favorite book on real estate. The title is really dull, so it makes you think that it isn't going to be anything spectacular, maybe even very textbookish. But that is not the case... the author is a very good writer and he does a great job of keeping you interested and giving just the right amount of information in each area. I know I have found a great real estate book when I spend an hour each day checking out local investment properties. This book is a complete guide from start to finish on purchasing a property. Other books may leave out a few details like what to expect with closing costs, or what different tax implications might be with different properties, but this book has it all. First off, the book makes a great argument toward invest in duplexes, triplexes, and quads (and it should). The debate for me has always come down to whether to invest in a smaller multifamily (4 or less units) or to invest in a larger complex. Loftis does a good job of explaining the pros and cons of each. And when you are starting out it makes excellent sense to invest is 4 or less units. Because if the property has 4 or less units it is still classified as residential (meaning to a lender that it looks no different than a single family home), however, anymore than 4 units it becomes classified as commercial multifamily. What makes residential more desirable and safer is the financing.- residential are much easier to get financed. You are more likely to get a 10% or less down payment, with commercial you are most likely to have to put down 20%. Also, with residential you are able to get a low interest 30 year fixed mortgage, but with commercial you are more likely to a higher interest ARM. And lastly, if you invest in a residential property and live in it, you are eligible for a homestead exemption, which reduces your property tax by up to 25%. All very compelling arguments! Throughout the books I had a several 'ah-hah' moments. Just little tips and tricks that I hadn't ever thought of before. Close at the beginning of the month- If you close at the beginning of the month then your share of that month's rents are prorated based on days left in the month. So if you close on the 2nd of the month you get 29/30ths of that months rent and the seller gets 1/30th of the rent. It's a nice way to get an 'extra' couple thousand dollars at closing. Forced Inflation- It's not really a new concept, but it's the first time I have heard the terminology. Forced inflation is forcibly inflating your rents by rehabbing/ improving the property. While doing this you have the ability to increase your rents a great deal with little costs in comparison to the enhancements. Say you put in some slightly used washers and dryers into each unit. It may cost a couple thousand dollars, but you have the ability to increase the rents of each unit $50-75. It will take you less than a year to get back your investment and then its all additional cashflow. Hold your Property a Year or More- If you sell your property in less than a year then you are taxed as if it were ordinary income. However, if you wait more than a year then your are taxed as a capital-gain. This would be 15% versus 30%. Meaning on a net profit of $50,000... you would have $42,000 after taxes instead of $33,500. That is a nice chunk of change! I expect every last one of you to at least glance at what is out there... Run some numbers and realize how awesome real estate is as a tool for cash flowing. http://www.realtor.com/- For Multi-family click the advanced search and click the multi-family box. http://www.erealinvestor.com/w/dowjones_n.html- Fun way to compare your property to others in the area. http://www.loopnet.com/- You can see some properties out of this, but to get the whole deal you have to pay some money. http://www.nestvestapp.com/#lite- If you have an IPhone, this is the best cash flow app out there... I highly recommend. This book is really good. I will recommend it to anyone I know that is looking to start doing the investment property thing. As always, if you have any questions on the book don't hesitate to ask. I would be more than happy to help anyone that wants it. Super post, Most of us take pleasure in any individual and her or his fantastic post. Your own post is reasonably beneficial in my opinion. I want to view the subsequent post. Kind regards about producing.